The My Little Margie TV show was a comedy series that aired on CBS for its first season and then on NBC for the final two seasons. It was about a 50 year-old widowed father and his adult daughter who lived together in an apartment at the luxurious Carlton Arms Hotel on 5th Avenue in New York City. The father tried to control his daughter's life just like he ran his investment firm. She, however, used various schemes to get her way and drove her father crazy. Usually, she would enlist the aid of her neighbor, her boyfriend or the buildings elevator operator in her schemes. I'm always thinking of you, Margie. Don't forget you promise to me. Oh Margie, Margie, it's you. In a highly unusual move, there was a My Little Margie Radio Show that aired at the same time as this TV version. The early 1950s were an unusual time. Television was still a fairly new form of media. Many fans still did not own sets so running both versions simultaneously did make sense. Different scripts were written for each version so there were also a number of fans who listened to the radio version and also watched the one on TV! 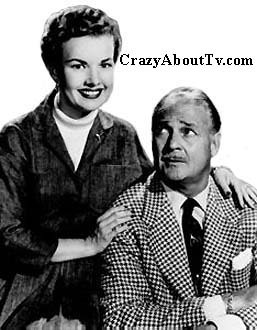 Gale Storm and Charles Farrell played the roles of Vern and Margie Albright on both shows! Dad: "I've been both mother and father to her since she was born. She's grown up now. When she was a little girl I could spank her and make her mind me, I had control over her. When she disobeyed I took her roller skates away for a week. What can you do when a girl reaches this age? She's completely out of hand. I've got a problem. Believe me, I've got a problem." Margie: "I've raised him from my childhood. He's nearly fifty now and you'd think he'd settle down, wouldn't you? Today, he looks better in shorts on a tennis court than fellows twenty five. Girls wink at him and what's worse, he winks back at them. I want a nice old comfortable father. I try to look after him, but he just won't settle down. I've got a problem. Believe me, I've got a problem!" Thank you for visiting our My Little Margie page!